Firstly they are very comfortable. Which may be their strongest feature! They are supplied with a plethora of moulded gels (eargels). All of this makes them easily the most comfortable headphones that I own. I expected them to be isolating but none of the eargels are. The most channelled gels still have a breathing feel which is nice (think: Pink Floyd). They stay in well without putting pressure anywhere. Which is the primary reason I find myself listening to music with them all the time. Going for a run or bench press; they don’t budge, don’t get in the way. 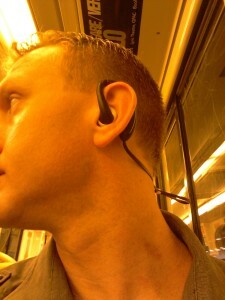 The gels that I selected don’t seem to get waxed up like isolating headphones. They are cleanly moulded, feel strong, flexible and dust/splash proof. Sound quality is the most criticised feature. They hardly provide the bass suggested on the sales page. Did the person writing that page even listen to them? If big booming bass is a must for you don’t by these headphones. However if mid tones (think: Cliff Richards) and good enough bass are your thing you will be perfectly happy. My metal and industrial tastes (think: Metallica / Prodigy) are suitably catered for with a 7 band equaliser on my Samsung phone. As I write this I’m happily listening to DEATH, yes the band. 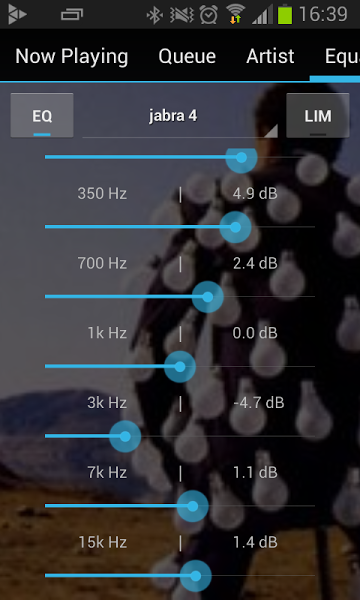 I am extracting decent sound when using an equaliser (I use GMMP on Android). With a -4dB scoop at 3kHz, around +5db on the bass frequencies and +1db on the top two treble bands. 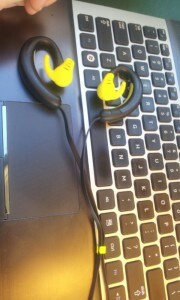 The trade off that Jabra designers have made for us is to provide very light comfortable headphones. This requires light batteries, electronics and light drivers / magnets. All of which limits peak power delivery. All in all the Jabra Sport Plus sound is ok to good with moderate volumes which may be a good thing for my hearing and probably adds to the comfort during longer wearing periods. You can clearly hear the music at moderate volume settings and with moderate background noise which tells you something about the distortion characteristics. Thus concludes my Jabra Sport Plus Review for those looking into bluetooth headphones to use when commuting and at the gym. Hope that helps and please comment below.